A Brief History of Sant'Eufemia. Before 1844, Sant'Eufemia was a frazione of Caramanico. Its was called Villa Sant'Eufemia. In 1845, the town became a separate entity called Sant'Eufemia. Sant'Eufemia a Maiella (sometimes Majella) was in the Province of Chieti until 1927 when the Province of Pescara was formed. Towns from the surrounding three Provinces (Chieti, Aquila and Teramo) were combined to form Pescara. Would you like to be in closer contact with the town of Sant'Eufemia a Maiella? Patrizia Boccaccio works in the municipio in SEaM and is responsible for tourism. She is creating a mailing list to keep us up to date on the events in the town. You will receive occasional updates on events occurring in St Eufemia through Facebook - Sant Eufemia Nel Mondo. This initiative will hopefully generate a greater interest in our families' place of origin. I don't believe the old story that the officials at Ellis Island changed the names. I don't think I've ever seen that in the records. The names might be spelled wrong on the ship's manifests but that's all. I've also come to realize that when the Ellis Island records were two pages, the first page (with the name) was filled out as they were boarding (most likely written by an Italian) and second page was done when they landed at Ellis Island. Take a look at They Changed Our Name at Ellis Island by Donna Przecha. Here are some of the variations of names from Sant'Eufemia a Maiella that I've seen in my searches. Sometimes the immigrant changed to the Americanized version. Other times, that is just how English speakers spelled the name after hearing it. My dad told me that spelling was never taught in the schools in Italy. In Italian almost every letter is pronounced so words are written as they are spoken and spoken as they are written. The way it was actually spelled did not seem to be very important. More about Italian Names and their English Equivalents - click here or click here. 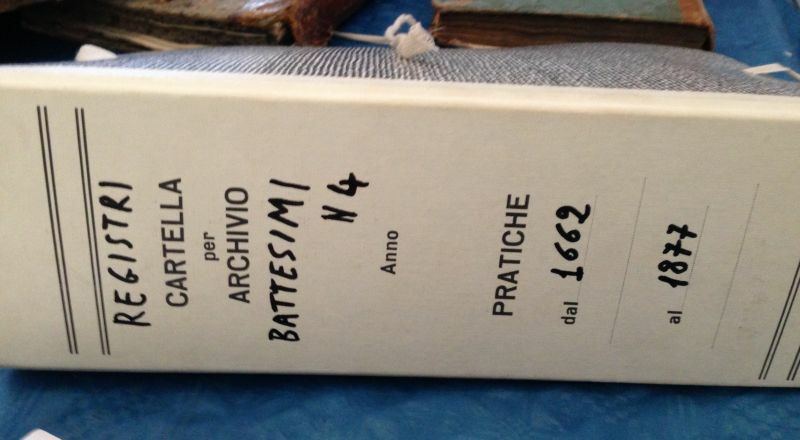 has been hard at work digitizing the civil records from towns in Italy including Sant'Eufemia a Maiella. We discovered the records from Sant'Eufemia were available last year and now they have added many more records so that it appears that every available civil birth/marriage/death record from 1809 to about 1920 is on-line. The Napoleonic Era - most of Italy was under French rule and we can thank Napoleon for forcing the Italians to start civil record keeping. Of course before 1809, the Catholic Church was very diligent in keeping baptism/marriage/death records but, so far, none of the Church records have been digitized that I know of. Before 1844, Sant'Eufemia was not a separate town and its records were kept in the nearby town, Caramanico. So for 1809-1815 records, we need to look at Caramanico where our town is listed in the records as Villa Sant'Eufemia. The Restoration Era - Record keeping continued but in 1844, Sant'Eufemia became a separate town. The Reunification Era - the country of Italy came into being with the reunification. Record keeping continued. The records from 1860-1865 are listed under the town name "Sant'Eufemia" while the records from 1866-1920 are listed under the town name "Sant'Eufemia a Maiella". These birth/marriage/death records are not complete (in particular, missing almost all of the records from the 1870's). Maybe those missing years will be added in the future or else the records have been lost. Our cousin, Dave diNardo, visited Sant'Eufemia in Oct of 2014. One of his stops was the Church to look at the records. He sent me this photo of one of the record books.